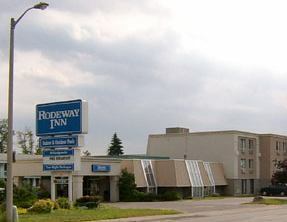 The Rodeway Inn & Suites is located on the historic area of Niagara Falls on Lundy’s Lane. This motel offers guests with 94 guestrooms that are both smoking and non-smoking and 10 suites, including family rooms and heart shaped jacuzzi suites. This motel is located some of the best attractions, entertainment, shopping and dining in Niagara Falls Ontario Canada. The Niagara Falls Rodeway Inn & Suites Motel provides guests with the best amenities to enhance your next stay in Niagara Falls Ontario. The motel offers guests an indoor and outdoor pool as well as an indoor hut tub.